The term Gladiator is synonymous with Roman culture, and while to us gladiatorial contests are little more than displays of extreme barbarism, contemporary Romans would have look upon these ‘contests to the death’ as a defining feature of their civilization. But who were the gladiators, and what brought them into existence? 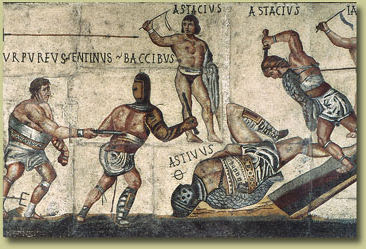 The Romans believed that gladiators first appeared in 264 BC. They were common slaves who were made to fight to the death at the funeral of a distinguished aristocrat, Junius Brutus Pera.. This spectacle was arranged by his heirs in order to honor his memory. Gradually, this gladiatorial spectacle became separated from its funerary context, and became staged by the wealthy as a means of displaying their power and influence within the local community. In fact, advertisements for gladiatorial displays still survive at Pompeii, painted by professional sign-writers. They have been found on house-fronts, and on the walls of tombs clustered outside the city-gates. The number of gladiators to be displayed was a key attraction - the larger the figure, the more generous the sponsor was perceived to be, and the more glamorous the spectacle. Most gladiators were still slaves. They were subjected to a rigorous training, fed on a high-energy diet, and given expert medical attention. Therefore they were an expensive investment, not to be dispatched lightly! For a gladiator who died in combat, the trainer – known as a lanist – may have charged the sponsor of the fatal spectacle up to a hundred times the cost of a gladiator who had survived. Clearly it would become significantly more expensively for the sponsor if they supplied the bloodshed that the audiences often bayed for. Although if a gladiator was allowed to be slain it was seen as an indication of their generosity. Remarkably, some gladiators were not slaves but free-born volunteers! The chief incentive was probably the down-payment that would have been received upon taking the gladiatorial oath. This oath meant that the owner of the gladiator troupe now had ultimate sanction over each gladiator's life, assimilating them to the status of slaves. Some maverick emperors with a perverted sense of humor made upper-class Romans (of both sexes) fight in the arena. But as long as they did not receive a fee for their participation, such persons would be exempt from the stain of infamia, the legal disability that was attached to the practitioners of disreputable professions such as actors, prostitutes and, of course, gladiators. Who were the Ancient Gladiators? HOW FAST IS A SNAIL?